It's always appalling to see animals abused and betrayed for profit, especially when the activity is legal and defended as a "sport." That's the reality of greyhound racing, but the reasons this detestable industry still exists defy not just our humane values, but common sense as well. The cruelty and trauma these dogs suffer is undeniable, and is spotlighted this month in the first-ever national report on greyhound racing, created by GREY2K USA and the American Society for the Prevention of Cruelty to Animals. The culmination of more than thirteen years of research, this report reveals systemic and shocking abuse to dogs caught up in a dying, poorly-regulated industry. Greyhound racing benefits a tiny group of cruel breeders at the expense of the more than 10,000 greyhounds that enter the racing industry each year. As our report shows, this antiquated and unpopular activity also costs taxpayers millions of dollars. Racing greyhounds are kept for 20 or more hours per day in warehouse-style kennels. To reduce costs, the dogs are fed raw "4-D" meat from diseased animals. Confined in stacked cages barely large enough for them to stand up or turn around, large greyhounds can't even stand fully erect for most of the day. When let out of their confinement, the dogs' health and lives are placed in even greater jeopardy. Since 2008, over 80,000 greyhounds have been registered to race and nearly 12,000 racing dog injuries have been documented, including more than 3,000 broken legs, plus broken necks, crushed skulls, paralysis, seizures and death by electrocution. At least 909 racing greyhounds died during that time period, 758 of them as the result of injury. In Florida alone – which takes advantage of having no law requiring tracks to report greyhound injury statistics – a racing dog dies, on average, every three days. Greyhound racing continues in seven states – Alabama, Arizona, Arkansas, Florida, Iowa, Texas and West Virginia – and in each one, greyhound cruelty and neglect have been verified, including at least 27 troubling cases since 2008. Sixteen greyhounds tested positive for cocaine during this period. One particularly gruesome situation involved a Florida kennel operator who walked away when the racing season ended, leaving 42 greyhounds to die of starvation, some with their mouths taped shut. 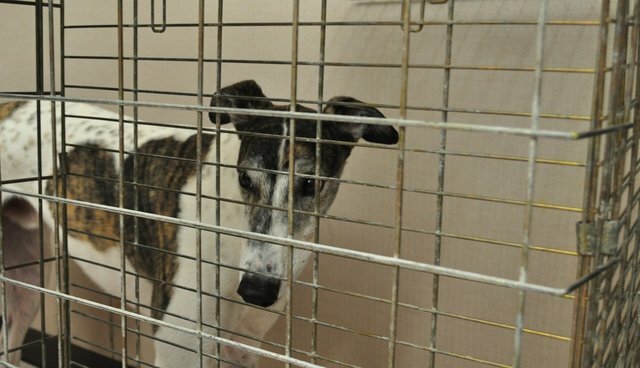 In March of 2013, a two-year-old greyhound was left to sit in her cage for four days after breaking her leg in a training race at the Wheeling track in West Virginia. Aspirin and a makeshift wrap were the only "treatment" she was given. Thanks to an anonymous tipster, "Kiowa Dutch Girl" was found, shaking in her cage and unable to stand, and ordered to receive medical care. Both trainers fled the jurisdiction in order to avoid criminal prosecution. This level of wanton cruelty and disregard is reminiscent of some of the worst atrocities people commit against animals for the sake of profit – including dog fighting. But unlike dog fighting, dog racing is completely legal in these seven states. You might assume there must be a compelling – if heartless – state or social interest that keeps greyhound racing active in these states. But there's none. The public doesn't want it. Since 2000, both the number of states with legalized racing and the number of racetracks in operation have been more than cut in half, largely because the public cannot tolerate the cruelty inherent to this activity. The states don't really want it. State governments often spend more to regulate the sport than they get back in revenue. In Florida – where more greyhound races are run than in any other state – the state loses between $1 million and $3 million each year on dog racing, because regulatory costs exceed revenues. It's no wonder that racetrack owners – tired of losing money on costly and poorly-attended races – also want out of the industry. But in most of these states, live racing mandates require racing licensees to keep the dogs running in circles, even when nobody's watching. In Florida, for instance, 12 dog tracks lost $42 million on racing between June 2012 and November 2013. During that same time period, every greyhound track in the state lost money on racing. These tactics are designed only to keep greyhound racing practitioners and breeders in business, with absolutely no regard for the animals' welfare or the best interest of the public. With racing dog breeders and trainers putting up a tough fight to protect their own interests, this abhorrent activity continues. But it can end immediately if the governors of these seven states take decisive action against animal cruelty, even when it takes place in a legal operation. Please sign our petition to urge Governors Bentley, Ducey, Hutchinson, Scott, Branstad, Abbott and Tomblin to follow the humane lead of all other states, and put a long-overdue end to the national shame of greyhound racing.